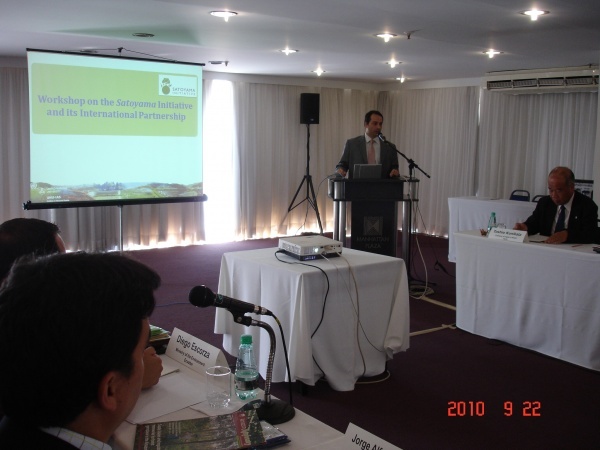 A South America Regional Workshop on the Satoyama Initiative and its International Partnership was held at Manhattan Plaza Hotel, Brasília, Brazil on 22 September 2010, organised by the Ministry of the Environment of Japan (MOEJ) and the United Nations University Institute of Advanced Studies (UNU-IAS). The purpose of the workshop was 1) to enhance understanding of the Satoyama Initiative and discuss its applicability to the South America region, and 2) to discuss expected activities and possible participation in the International Partnership for the Satoyama Initiative (IPSI). The workshop was attended by government representatives from 6 countries in the South American region (Bolivia, Brazil, Chile, Colombia, Ecuador, and Peru), as well as experts based in the region. The Workshop has provided an arena for fruitful discussions among the participants, including the applicability and usefulness of the Satoyama Initiative in the South American context and beyond, which will be fed into discussions at CBD COP 10.